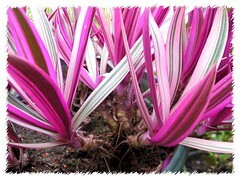 Plant type: An ornamental perennial succulent herb, native to Tropical Central America. Light: Full sun to partial sun. Can tolerate shade but result in pale-colored leaves. Moisture: Regular watering and moderately. Drought tolerant once established. Soil: Well-drained loamy soil. Prefers fertile composted soils, though can tolerate less acceptable conditions. Propagation: This dwarf variegated cultivar of Tradecantia bermudensis ‘Variegata’ is sterile and non-seeding, thus propagated by division of its rhizomes or offsets. It can also be propagated from herbaceous stem cuttings too that root easily. See the right image – there’s a stem hanging down outside the pot with 3 young offshoots. To propagate, I could have easily pluck them and push into potting soil to let them spread. It’s that easy! Even those plants in the pot can be done likewise. 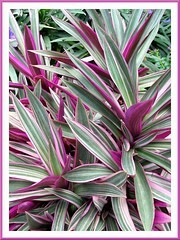 Features: Tradescantia spathacea ‘Hawaiian Dwarf’ is a short and compact herbaceous plant that grows moderately to a height of 0.5-1 foot (15-30cm) with a similar spread. It has a clump-forming habit, self-propagating by offshoots from fleshy rhizomes (rootstock). 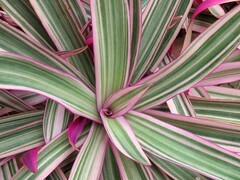 Each plant forms a rosette of stunning tricolor foliage of white, green and a tinge of pink on the upper side of leaves, with pinkish purple undersides. Its variegated leaves are short, 4-6 ins (10-16cm) long, stiff and blade-like, smooth-textured and closely overlapping around stout herbaceous stem, offsetting to form a striking and colorful colony. 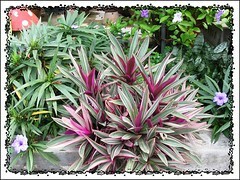 Usage: Variegated Oyster Plant ‘Pink’ is popularly grown for its colorful foliage and texture attributes. Being compact and low-growing, it will be most ideal as a ground cover or front-of-the-border grouping in garden beds or borders. Great specimen for landscaping too. Also, very suitable for planting in combination planters and hanging baskets. As a houseplant, it’ll look lovely in small ceramic pots. 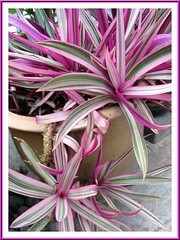 Care: Tradescantia bermudensis ‘Variegata’ is an easy care plant. 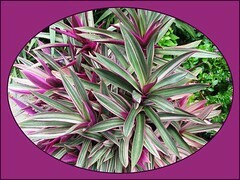 Requires no pruning whatsoever as it is a dwarf cultivar and is least bothered by pests or diseases. If the colony of plants gets too big over time, just remove stray or excess plants by plucking them off or cutting straight into the clumps with a spade and plant them elsewhere or discard them. Preferably, grow it in hot and sunny areas as it just love the sun and do not overwater as it can cause root rot. Nonetheless, it thrives very well in our tropical garden and from a single plant, it has multiplied itself many times over, generously ‘throwing’ countless offsets to our greatest pleasure. We have more than enough free plants for our garden, to last a lifetime, as well as to share them with friends and neighbours. May also be poisonous to dogs, as I had a Golden die which was tethered near Variegated Oyster Plant and died of unknown poisoning. I have this Variegated Oyster Plant in Merritt Island, FL (East Central Florida) as a ground cover or front-of-the-border grouping in garden beds. It spreads quickly covering everything else except plants taller then it! Is the perennial Dwarf Oyster Plant invasive like the wood violets? I wish I had never heard of those violets; they are now in my lawn grass and it does no good to try to pull all of them up; they keep multiplying and coming back!! Is the Oyster Plant really poisonous to pets? I don’t want to kill any animals, let alone a child! Hi Fran! We don’t find the dwarf tri-coloured plants that we’re growing invasive at all as they are not fast growers, moreover they’re shallow-rooted and can be easily removed when unwanted. Surprising though that over the years, newer plants that offset from the grounded variegated ones are no longer variegated and these are the ones that are spreading quite fast, but all the same, can be easily uprooted and discarded. Don’t know about it being poisonous to pets, but Rudy in her comment above seemed to suggest that. Very informative article! Where can I get one of these variegated starts? My Grandmother gave me a regular Moses in the Boat when I was a child. I loved it and have been looking for one when I found your site. Love the variegation and prefer it, now. Thanks for the thumbs-up, Lisa! Sorry though that you have to google further to know where you can get these plants in your region, as we’re not a garden retailer, just passionate home-gardeners.